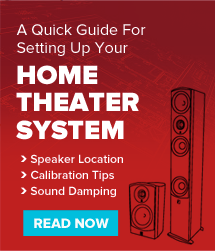 Having the center channel speaker positioned correctly is critical for an effective home theater setup. This speaker is really the workhorse in your system and it gets used more than any other speaker when watching movies or TV. Making sure this speaker has the right home can make or break your listening experience. The front left, center and right speakers work together to form the “front soundstage.” The whole purpose of this is to have the action on screen represented accurately through your speakers. So anytime someone is speaking on screen, you’ll be hearing it through the center. If you ever question how important the center is, go ahead and put a movie on, then unplug the center channel. Usually, having the center speaker directly below the TV will be the best spot. This should be roughly ear level and will simulate sound coming from the TV best. If you can’t put it below the TV, the next best place is directly above it. The most important thing is to keep it in close range to the TV. If you put the center too far above or below, you’ll lose the illusion that the dialogue is coming from the actor. Tip #2: Keep the center channel speaker in the center! This may seem obvious, but we still occasionally get asked if it’s okay to put the center channel to the side of the TV. It’s not! There is a reason it’s called the “center” channel…. When you want that spine tingling sensation when Jack Nicholson delivers his courtroom speech during A Few Good Men, but his voice sounds like it’s coming from the other room because the center channel is sitting on a bookshelf to the side of your 80” OLED, it kinda ruins the mood. The #1 problem we see with center channels is that they get put deep inside a piece of furniture. This is bad for multiple reasons. First, anytime you place a speaker inside something else, you’ll be listening to the sound of whatever it’s inside of. I can guarantee that your credenza will not have as good acoustics as our painstakingly engineered speaker enclosures. Second, the sound waves propagating from the drivers cannot extend naturally because of the surfaces around it. This is like putting a straight-jacket on a pole vaulter (maybe a new Olympic sport?). At best, this will muddy the sound. At worst, the sound will be completely incomprehensible and you’ll live the rest of your life with subtitles on. The best thing to do is pull the speaker all the way to the edge of the shelf. Whether on top of or inside a piece of furniture, this will improve the center’s performance immensely. Let me ask you a question, if you wanted to look at someone’s face in the dark, would you shine a flashlight on their knees? No! So why do the same thing with your speakers? Sound gets more directional as the frequencies get higher. If the tweeter isn’t looking at you, neither is the sound. There are many compromises that the home theater enthusiast must endure, so if you have to put that center channel in a non-ideal position either low or high, make sure it gets angle toward your face. This way you’ll actually get all that sound you paid for. Choose a different location. If you have the option to locate your TV somewhere else (ANYWHERE else) in the room, do it. Then you can commission an epic oil portrait of yourself to hang in that spot above the fireplace. Get creative with mounts. There are numerous options for TV mounts. Get a full motion articulating mount so that you can extend and elevate the TV. This can free up some room for a center below it. Depending on your ceiling height, you can mount the center on the ceiling. This can be quite effective as long as the speaker isn’t too far away from the TV and you angle it toward the listening position, as we discussed earlier. Another option is to use an in-ceiling speaker for your center channel. Not ideal, but still workable. Get a smaller TV to make room for the center. Obviously not the most popular option, but who cares how big your TV is if you can’t hear it. If all you have is a cavity for the TV, buy a TV with enough room to squeeze a center speaker in there. Most obstacles can be overcome with a little creativity and flexibility. So even if your room seems impossible, take a deep breath and open your mind, Quaid. Top Movies for 2019 What Is A Crossover? A Beginner’s Guide.